She almost caught the notorious Lizard King serial killer once. Now, he’s back—with a vengeance. For three years, Investigator Cassie Dewell has been on the hunt for a serial killer known as the Lizard King, whose hunting grounds are the highways and truck stops where runaways and prostitutes are most likely to vanish. Now, working for the Bakken County, North Dakota sheriff's department, Cassie has set what she believes is the perfect trap for the Lizard King—and she has lured him and his truck to a depot. But the plan goes horribly wrong…and Cassie loses her job, her reputation, and her hope for justice. At the same time, Kyle Westergaard, a troubled kid whom Cassie has taken under her wing, has disappeared after telling people that he’s going off on a long-planned adventure. But Kyle's disappearance may have a more sinister meaning than anyone realizes…Now Cassie must track down Kyle and take down a killer who is as ruthless as he is cunning. But can she do it alone, without losing her own humanity—or her own life? Paradise Valley continues the Highway Quartet series from bestselling author C. J. Box. C.J. 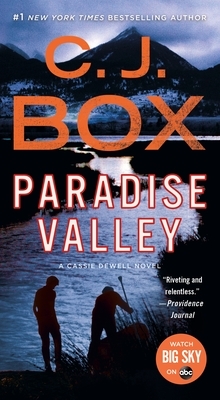 Box is the author of more than a dozen novels including the award-winning Joe Pickett series. He’s the winner of the Anthony Award, Prix Calibre 38 (France), the Macavity Award, the Gumshoe Award, the Barry Award, and an Edgar Award and L.A. Times Book Prize finalist. Open Season was a 2001 New York Times Notable Book. Box lives with his family outside of Cheyenne, Wyoming.